Damaging wind and rain is blowing from the west to the east, into the Washington metro region. The National Weather Service has issued a severe thunderstorm warning until 8 p.m.
Doppler radar indicates that a line of storms capable of producing quarter-sized hail is crossing into the NBC viewing area. The size and speed of the storms indicate the chance of damaging winds blowing in excess of 60 miles per hour. NBC's Chuck Bell said the storms will reach the area between 3 p.m. and 6 p.m. The thunder clouds are moving in a uniform line, so that once the rain does fall, calm and clear weather should arrive behind it. 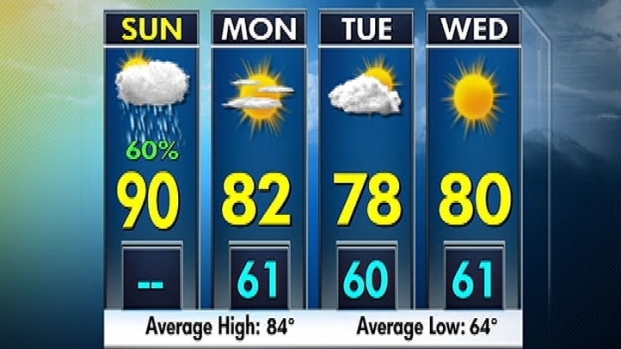 Chuck Bell's daytime forecast for June 12, 2011. For more information on individual alerts and to watch the radar map, click here.